Adult-only soft-ball pits are popping up around Britain in a bid to reduce stress levels and boost creativity. A pop-up ball pit has just opened at the Museum of Science and Industry in Manchester – only months after similar initiatives were launched in London and New York. 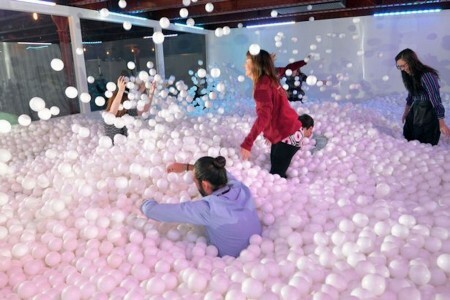 Constructed by creative agency Pearlfisher, the pool contains thousands of calming white balls which were designed to remind us of snow and thus encourage playfulness. In addition to relieving stress and promoting fun, Jump In! can host business meetings in the area which is said to inspire coherent thinking.